Stoke is, without doubt, a football town. After all, how many places situate a statue of their legend (Sir Stan, born Hanley 1915) in their main shopping centre rather than in the car park at the ground? 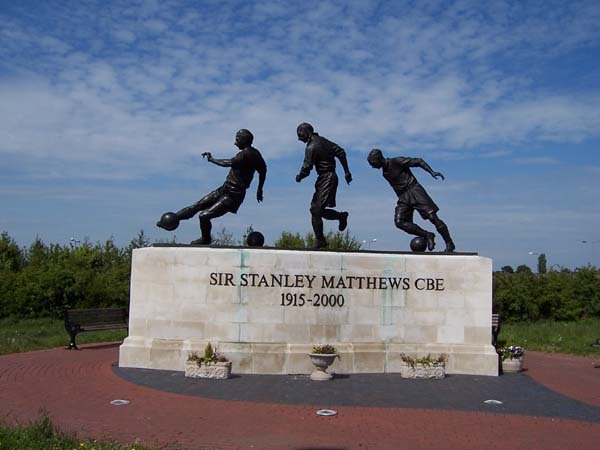 Add the 3 further likenesses outside the Britannia and you see my point. There is a fine history behind Stoke City, although the great days seem to be disappearing further into the distant past. 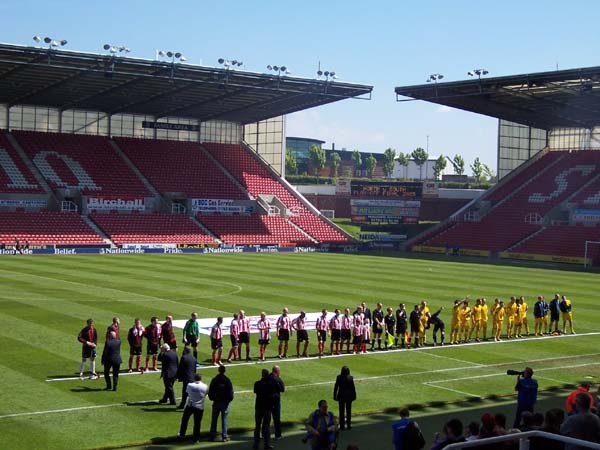 However the usual effort of talking up (and down) the ambience and club of the place I happen to be is misplaced today as today isn’t really about either, other than the fact that the Conference have booked the relatively brand new Britannia Stadium to host their play-off finals. Last night Carlisle beat Stevenage to make a swift return to a division that has changed it’s name in their absence. Possibly in the hope that Carlisle wouldn’t be able to find it again. Curses, foiled, and such. 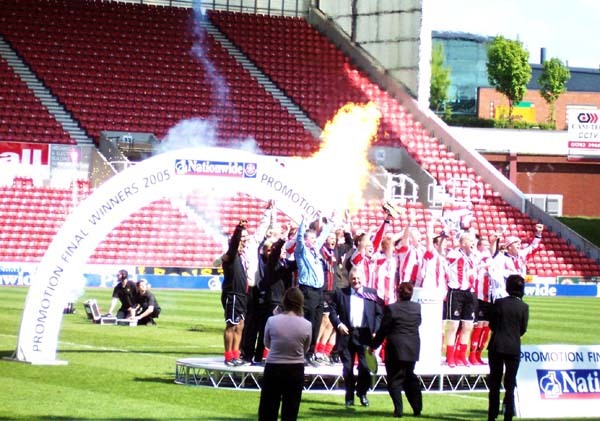 Today though is a new thing, a first play-off final for the North and South feeders to distinguish the 3rd promotion spot split between the 2 divisions. Certainly these end of season wheat-sorters keep the interest up (1 up only from each of 3 feeder leagues, as was until last year, is certainly not conducive to keeping several seasons alive) as the 2 finalists are the teams that finished 5th (and therefore at the base of the play-off cut) in each division. Talking of Stoke’s history, the two clubs involved today could not really be much more different in terms of background and tradition. Altrincham formed in 1911 and have fine records in the Conference, the FA Trophy and the FA Cup (14 league scalps with Blackburn, Everton, Liverpool and Spurs, twice, also run very close). Eastbourne Borough on the other hand have only had their handle since 2001 (much to the annoyance of Eastbourne Town and Eastbourne United), having previously competed as Langney Sports in the Sussex League. They too took FA Cup scalps during their time as an awkward County League banana-skin, but their giant-killings came in the form of Harrow Borough, Leatherhead and, ahem, Havant & Waterlooville. Comparatively excellent achievements nonetheless, and their rise through the Sussex League, Dr Martens Eastern and Premier to the Conference South has been meteoric. A win today and elevation to the top non-league rung would make it magnificent. The great geographical divide also adds spice with a metaphoric Hadrian’s Wall running between, roughly, Swansea and Norwich. A variety of flat-capped pigeon fanciers and Mockney Chavs (as each other would not doubt have it) have been manning the turrets all season claiming their league to be the best of the two. Indeed, in the run up to this fixture, the web fora for each league were filled with ‘Do the Conf North/South* proud (*delete as applicable)’ type messages. For Altrincham, a 33 mile trip, for Eastbourne a 235 mile haul, so in a stadium built for 28,218, a final for 2 leagues the majority of football fans are not yet aware of, it is perhaps unsurprising that the Conference marketing suits were putting the call out for neutrals in the Stoke area to come out for it. We neutrals even got our own window at the ticket office. Certainly there would be a smattering of interest from the more rabid followers of teams at level 6 to turn out to see what might have been for their team. As it is less than 1 side of the Britannia is required and we scattering of fence sitters, sociopaths and saddoes are positioned on the lower tier next to the Alty army and beneath the drums, bells and trumpets of Eastbourne in the upper level. Scoff at the crowd size and the swathes of empty Stokeite seating if you will, but the atmosphere is excellent (despite the drums). Of course, it is a game of cat and mouse as to who will be the first to sing ‘you dirty (north/south)-ern bastards’ but after 17 minutes and a particularly rough challenge from Eddie Hussin, Eastbourne break for the line. Chances come at either end in the first half, but the singing banter is of most interest. Boro: “4 of you singing, there’s only…”. Alty: “Who are ya?” It’s 0-0 at half-time, but Eastbourne have edged the North/South vocal battle. However it is to be Alty’s day on the pitch as they knock up a couple of goals not too far apart at the start of the second half, first Rod Thornley planting it unpretentiously away after some box pinball, then Val Owens swooping like a kestrel to push the ball in with his shiny pate. In the 90th minute, Eastbourne finally get somewhere and convert a penalty kick, to give Altrincham something to think about but not long after it’s finished and the Alty get the opportunity to mount the podium with the box-fires growling flame and pyro cracking away. Nice the Conference should go to that effort. As the celebrations go on, the blue balloon has someone made it round to the Alty section and despite it being wrinkled from it’s prior frenzy, it takes on a dove like quality, as though welcoming Altrincham to the national Conference, giving them a hand up to take Carlisle’s recently vacated spot. Perhaps that’s a bit too ‘American Beauty’ for yer average South Manc non-league hanger on though.